You know it's almost September and no matter how you look at it, you gotta remember it is truly tomato tornado time. Me & Myself hears these are Heirloom tomatoes so I'm checking them out uppa close to see exactictically how old they are. Wondering now if tomatoes have 9 lives like me! Natch! It's time to Mix & Match. Now this can choke you uppa, but look at whatza came out of my vegetable patch for my Mix & Match. Catzowey! I catnapped through my Gotcha Day on August 5th! 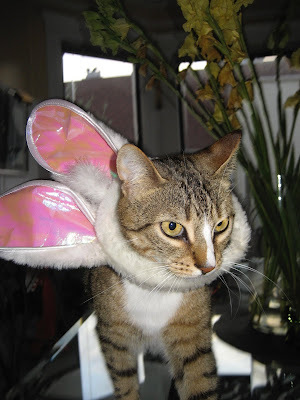 But Me & Myself believes itza never ever too late to celebrate 7 funtasticat years and show meowvalous you what it was like on my Gotcha Day back in 2006. The moment I relocated to my forever home, I learned to appreciate the finer deeziner things and I started loving EyeTailYun FurKneeChure when I gots my first fine feline Fort. That first day, you could say, I was feeling somewhat frisky! You know I'ma EyeTailYun so pizza meowgarita izza giganticat part of my diet even at 62 days yungun. The pizza delivery purrson fainted when I paid with my MasterCat card. Do ya thinks they think I'm too yungun to have a credit card? More meowvalous things I did on my first day: I took up a hobby - feeling flower power - cuz it's relaxing. My 1st Gotcha Day in my new forever home was a day to remember but I can't remember it all cuz I passed out from being so so so exhausted. 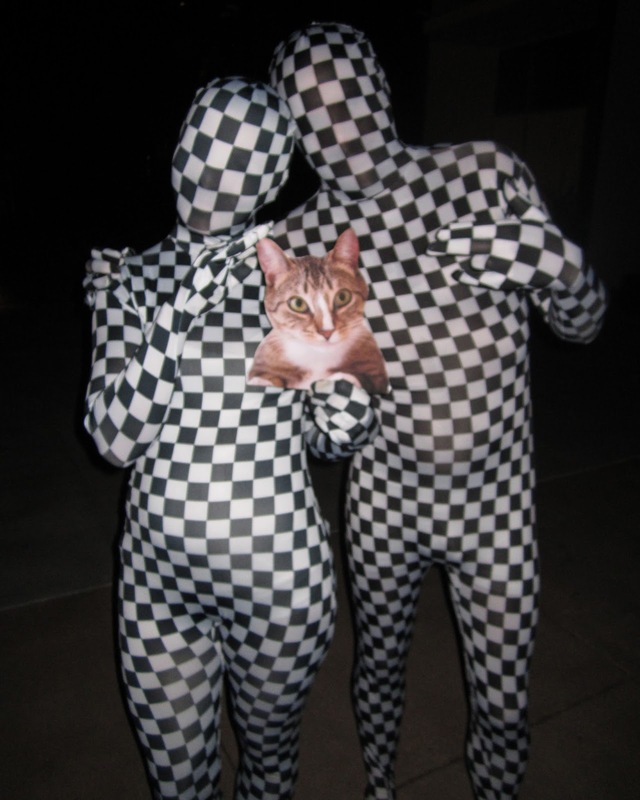 The past 7 years been meowvalous and cheers to more funtasticat revelry! Catzowey! 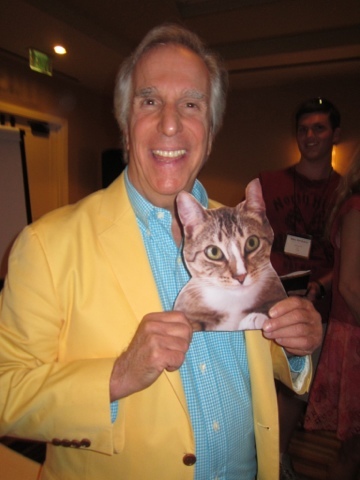 Itza purrrfecto day when Me & Myself is meeted and greeted by dat Happy Days über super star, Henry Winkler! This guy had a happy day and looked a little dazed with my ManCat self resting on his bambino sized bicep. 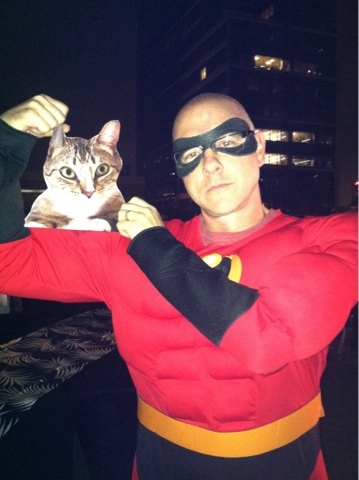 My Meowster muscles are bigger than his, yep uh huh. Itza happy day every day when I'm out on da job working in Animal Assisted Therapy and often I brings a furiend with me. 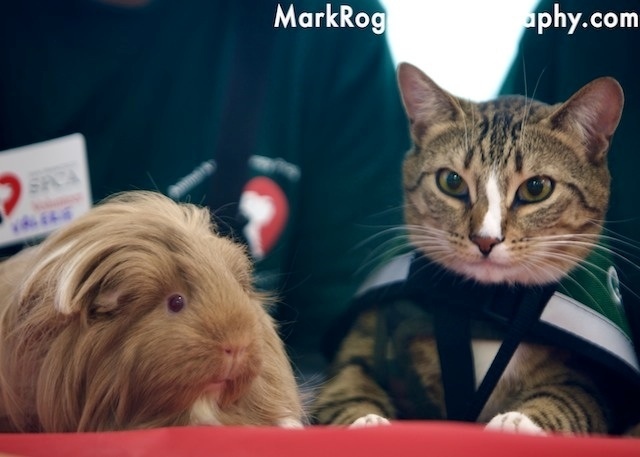 Izza purrfeshunal to look like ya know whats youza doing so I wears my official on-the-job jacket. Catzowey! I'm not seeing spots or dots but I AM being held in da dark by some critters who's not from EyeTailYah!That means I must have landed near Hollywood! Gotta be checking out my alien pals OR are they checks outing me & myself? 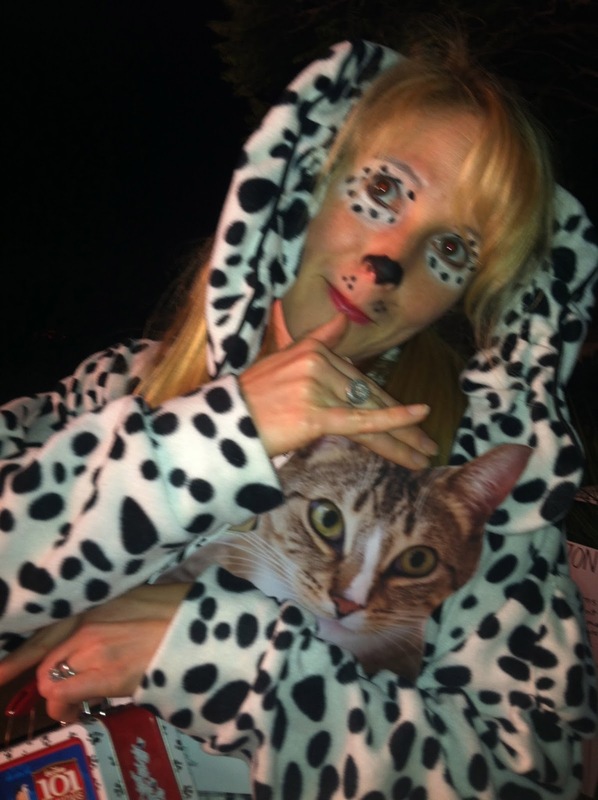 Gonna have a spot in the mewvie 101 Dalmatians Meet The EyeTailYun Kitty! Phew! 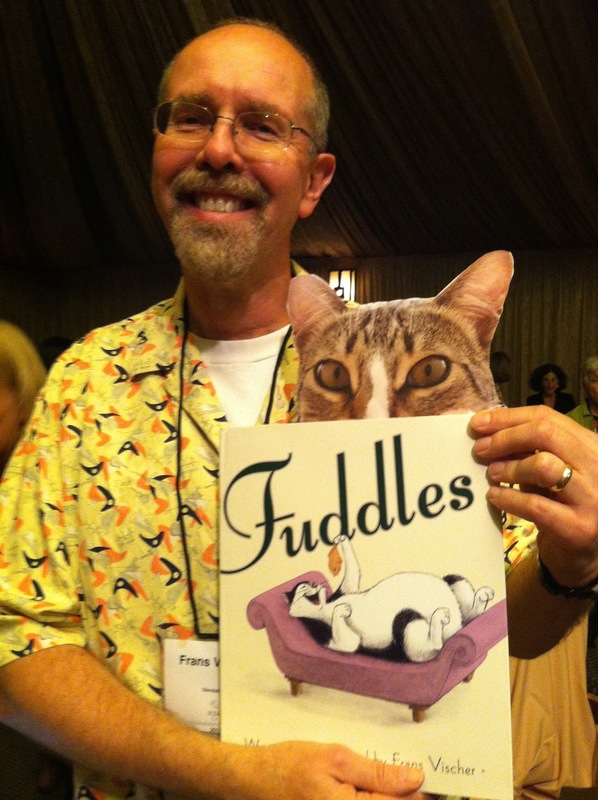 Meowvalous to find a real deal dude near Hollywood, and I found "Fuddles" and his poppa whooza the illustrator & author of the catzowey FUDDLES book! Pssst, Fuddles real name is not Fuddles nor Guido - psssst again, it's Felix! But datza secret. And MORE pssst, Felix's dad is Frans Vischer! I thinks he's excited to have meeted Me & Myself! Yep Uh Huh! WOWza MEOWza! Can ya see Fuddles & his poppa have pawsagraphed the book just for Me & Myself? I'ma NOT sad, but nothing more meowvalous than being cheered up more by the Author & super dooper uber Illustrator of "HOW TO CHEER UP DAD" and this book izza sneak peak cuz itza being published Spring Time in 2014 (lotsa catnaps between now and then). Me & Myself was shmoozing its secret special edition with the infamous cheery Dad, Signore Fred Koehler . Catzowey Fred made me purr fur shure. Always feed your create-a-cative soul after meeting & greeting all the famoso stars of words & pictures in da world of children's books - yep youza purrobably gonna see my book published within my 9 lives fur shure! I Wish You a NonCATastrophic week!